Sean Dyche believes his side have moved forward from last season. But he doesn’t have any concerns about increased expectations on his side, after their start to the Premier League season. Burnley switch their focus to the Carabao Cup tonight against Leeds United at Turf Moor, having lost one of their first five league games. 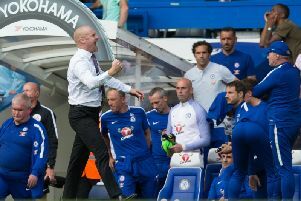 They are unbeaten away from home, despite having faced champions Chelsea, Spurs and Liverpool, and, Dyche said: “It’s not something I have a problem with, there’s a reality, an earthiness, I think it’s aligned with the reality and we’ve worked hard with that. “We don’t think we’re something we’re not, there’s an authenticity and the fans buy into that. “They’re not thinking ‘why are we not having 500 passes?’. “People know where we’re at, and we know. “We’re moving forward, we think we’re a slightly better version than last year, but there’s certainly no guarantees, I dont think we’re so radically different we’re going to go ‘no problem, Premier League for ever’, I don’t think that will be the journey of Burnley, there has to be a more authentic and honest feel about it, and at the moment, every season is very tough for us. He also has no qualms about the more direct football utilised at Liverpool on Saturday: “I’m intrigued by the branding of teams, when it’s quite obvious our players are different to clubs like Liverpool. “As a manager, it’s your job to make the best of what you’ve got. “I have no problem with it, we deliberately got the ball as far down their throats as we could, because we felt that would be effective. “Yet, two games ago against West Brom, I felt we played some fantastic football, and we lost. That’s the weirdness of football. “That has to be done on the training ground, and as a team on the pitch to get points. It’s finding that balance, individual and team development is the key, so I’m not one to worry too much whether it’s long ball or short ball, it’s the right ball that counts. “Glenn Hoddle would have never played…people would have said you can only pass it 10 yards, no long balls. “I marvelled at him landing the ball either foot from anywhere on the pitch, short, more long, and opening situations and gaps. “Don’t be afraid to play a longer pass. These players, even ours, are Premier League players, if you think they can’t land a ball from 40 yards onto someone’s chest…they can. “Why take away the ability to do that? “Graham Taylor told me a fantastic story, when he was deemed long ball, they came here with Watford back in the day, and he’d statted 15 games, and wondered why he was getting it, and Bob Paisley wasn’t.